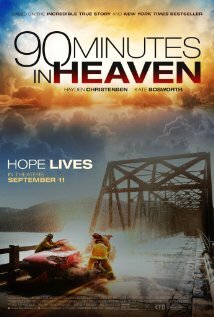 Samuel Goldwyn Films releases 90 Minutes in Heaven on September 11th, 2015. NYC MOVIE GURU: How did you find the right balance between entertaining the audience and provoking them emotionally as well as spiritually? MP: There was a very serious side to [the book] 90 Minutes in Heaven---it was very heavy. It reminded me, basically, of a war flick from the 1970's. When I wrote the first screenplay, it was very one-sided. I was able to work in the transcripts of Don Piper's wife and find out how she felt at the time. The character balance I knew was going to be okay, but there was no humor in it. There was nothing funny about these tragedies. I thought to myself, "That's not real life. Real life has tragedy right next to humor. What I did was interview Don Piper about some of the funny things that would happen, like the nurses, the dog and getting stuck on the toilet. We infused humor right next to tragedy and, I believe, it worked. NYC MOVIE GURU: What kind of questions did you ask Don Piper when you first met him? MP: They were very heavy questions, like, "What did heaven specifically look and feel like?" As filmmakers, we have references all the time, like we want to reference Monet or Van Gogh or a Scorsese film or whatever to figure out how to put it all together. It was very indescribable, so I felt like I was a detective all the time trying to find out all the details. I scooped out what we see in the film now based purely on his accounts. NYC MOVIE GURU: Did have a PG-13 rating in mind while making the film? MP: It was always going to be based on the wreck. We managed to do the wreck exactly the way was wanted to portray it. We wanted as much blood as you see onscreen, and then we would see what rating would be given and decide if we wanted to dial it back or forward. We weren't quite sure with that graphic material where the borderline was. You know the boundaries of language, but you don't know it with violence, gore or real-life trauma. We felt like we didn't have to dial it back because it was the right portrayal for this type of movie. NYC MOVIE GURU: How challenging is it to know when to trust an audience's patience? For instance, you didn't include the scenes in heaven until much later in the film. Why did you choose to include it later rather than earlier? MP: That's me bullying the audience, and it's also me trying to carve out how Don felt. He never really wanted to tell that story. He had such a hard time explaining to people that he visited that he saw heaven. So, I wanted to do the movie the same way. I wanted you to feel that this guy is not telling you something--he's not telling his family. Putting the heaven scene toward the end of the movie put you in the same situation that he was in. NYC MOVIE GURU: Do you think that Hollywood films condition audiences to a certain extent? MP: Maybe Hollywood as a collective conditions audience. Hollywood isn't such a place as living under the dome as we all want it to be or think it should be. I do feel that if you have success in the superhero or horror genre, the minute that there's a success, they're going to repeat that as many times as they want. In that sense, they're conditioning of you is primarily business-based. NYC MOVIE GURU: I believe that truly special effects are related to humanism and can be just as simple as two people talking in a room; CGI should just be called standard effects. Do you agree or disagree? MP: If you can get that magic going, that's a large amount of talent. There aren't a lot of directors who can do that very well. Quentin Tarantino is one director who really knows that special effect very well. He also learned it over the years from other masters who do it. Kurosawa has that special effect, too, and Scorsese. NYC MOVIE GURU: Do you feel like the American value system might be corrupted in a certain sense? MP: I don't know if it's corrupted. The focus is shifts to our palm---instead of looking across, you're looking down. That has a lot to do with connections with people. We're making the world smaller with technology, but we're also missing a human connection with people. NYC MOVIE GURU: How do you define charisma? How did you detect Hayden Christensen's charisma? MP: Charisma, to me, is Paul Newman. That's my definition of charisma, especially in this business. With Hayden Christensen, he's a terrific young man who has a great sense of being and a quietness about him. He can really hold a moment. I don't know if he knows that he has charisma, but inherently, he has the capacity to be a very charming person. NYC MOVIE GURU: Which actors do you imagine casting to play the older versions of Don Piper and his wife? MP: If he was still alive, Gregory Peck would have been great. I would love the work with actors from that generation. I love the way that Julie Christie did her thing back in the day. I would love with great actors because they teach me a lot. NYC MOVIE GURU: Do you feel that it's easier to find more dramas on TV than in cinemas nowadays? MP: TV is great because you can get to concentrate on many different characters over a long period of time. They don't have to make decisions that happen within a 2-hour window; they can take a few years to really get you there. When a movie is good and seems to be melodramatic, people say that it's like TV and that's a bad thing. There were melodramatic movies in the 80's and 90's, though, that seem to be ok.
NYC MOVIE GURU: How do you feel about the fact that up to 30 new movies can open in New York in one weekend? MP: There is a lot of product. I'm very good at ignoring the influx of it all. It's fortunate that we're in a situation where we can be creative and put stuff out there, though. NYC MOVIE GURU: Given that each of your film have been very different from one another, is that a conscious decision on your part as a filmmaker? Michael Polish: It's somewhat conscious. I like to learn about different ways of storytelling. It might be my way of going to film school. I would like to re-visit some of the things I've done in the past---I wouldn't mind doing a horror film or thriller again. I think I can get better at it. Lately, my career has been built on trying to put an original voice in the stories that I want to tell. NYC MOVIE GURU: Related to that, Hot Bot, your next film, is totally different from 90 Minutes in Heaven. MP: It's a total take on Weird Science. It's a pure homage to those goofball comedies with a little bit of morals here and there. NYC MOVIE GURU: Which films would make an interesting double feature with 90 Minutes in Heaven? MP: Stairway to Heaven (the UK title is A Matter of Life and Death), which I believe is a beautiful movie. That would be a great partner with 90 Minutes in Heaven because it's about angels, funny and heaven. It's almost like the Warren Beatty movie Heaven Can Wait. I wouldn't mind watching To Kill a Mockingbird. I used to the double features a lot and both films were completely the opposite. I remember seeing E.T. with Excalibur.